I know summer is all about the grilling and BBQ, but when it starts getting unbearably hot outside, eating heavier foods just doesn't sound very appealing. Greasy hamburgers, sticky ribs, and mayo based salads weigh your belly down, leaving you with a feeling of sluggishness and bloating. And, who needs that on top of dealing with sweltering temperatures? When planning out this week's dinner menu, I ran down the Golden Blossom Honey recipe list to see if there was anything on there that would make for a great summertime supper idea. I was looking for something light but filling, and would have ingredients that would appeal to my husband. I said "Bingo!" when I came across this Crab Meat and Avocado Salad. Jason loves seafood, but for some reason in all of our years together I have never made anything with crab meat, so I thought this would be a fun dinner surprise. 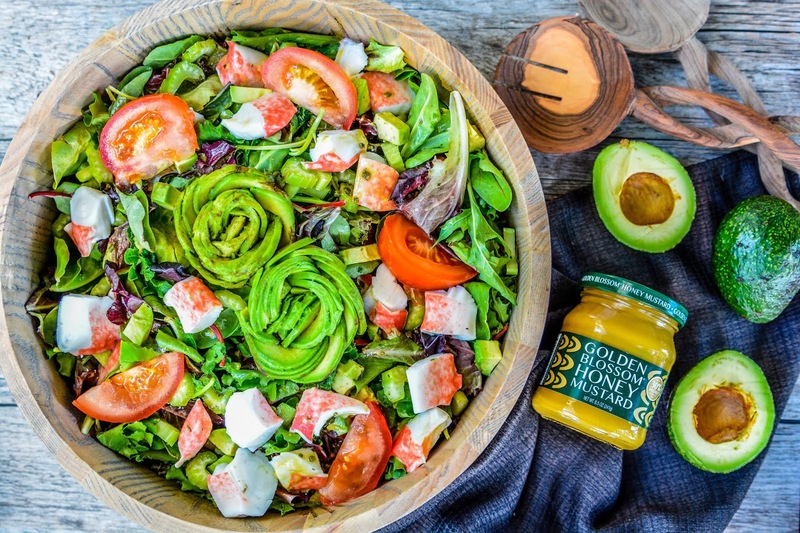 Toss in avocados (one of his favorite foods) along with some juicy tomatoes and celery for crunch, then top it all off with a tangy Honey Mustard dressing. This recipe is nothing short of summertime perfection for lighter eats. It's great for lunch or dinner, or to take to your next summer picnic or BBQ. You'll feel so much better eating this than stuffing your tummy full of Aunt Beth's fat-laden potato salad. Trust me! What's your favorite lighter dish for summer eating? Yeah, the heavier stuff just makes one feel blah when the heat goes all super high. Can't say I've ever tried crab meat. No surprise though, huh? I need to work on those roses. I saw a YouTube tutorial on them last week and thought I'd attempt to make some. While not incredibly terrible for my first attempt, I definitely need to work on them more. I don't eat meat either, so I never would have thought of this combination. However, I suppose it makes sense since you see salads with chicken and ham and such in them all the time. You have the best recipes! Dinner time must be a treat at your house. That looks amazing. That looks delicious! I always try to have some 'lighter' meals for summer (if I don't have to use the stove, I don't!) and this looks delicious! I love avocado, and I have yet to try crab meat in a salad, but I think I may need to now! That's a good looking salad! My husband is from Maryland and is persnickety about his crab, but I believe that even he would enjoy this. That sounds like my kind of salad. That looks amazing! We enjoy crab meat, and it's sure to be a hit. 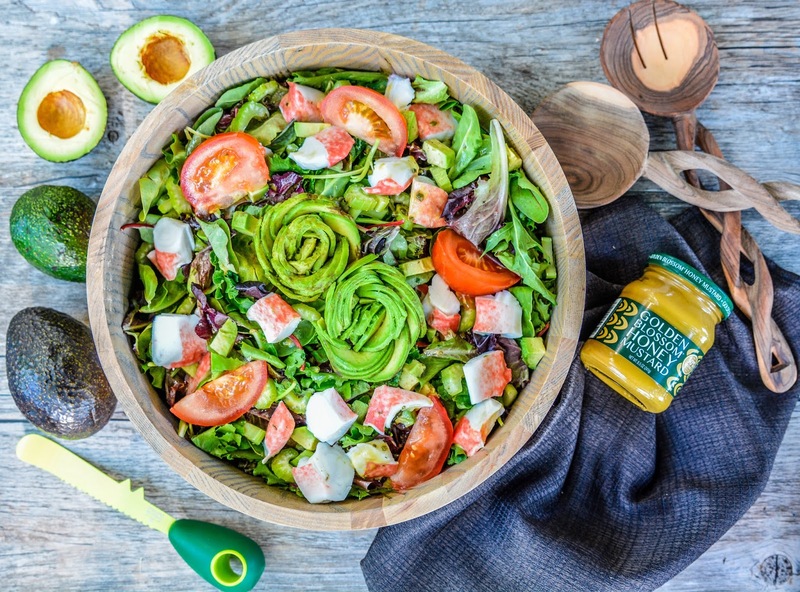 The combination of crab meat and avocado in this salad is a great combo. I could see this as a hit on the 4th of July! I'm intrigued with combining avocado and crab meat. I think this salad is a full meal in itself. This salad sounds like it has a really intriguing flavor. Hubby likes crab meat and avocado so he'd probably be up for trying it. this sounds amazing! my daughter loves avacado, i'll have to save this to make. I haven't tried adding crab meat in a salad, but your salad recipe really sounds delicious! I will make this soon. My husband has been asking me to make him more salads. Yay this is pescatarian friendly! Looks absolutely delicious I would love to make this salad! Wow, I have had a salad like this with crab meat in a restaurant but I have never made it myself yet. This looks like a great recipe to try! Lighter eats are a must in the summer, I agree. My granddaughter loves seafood and avocado. Bet she'd devour this if it was on her plate!